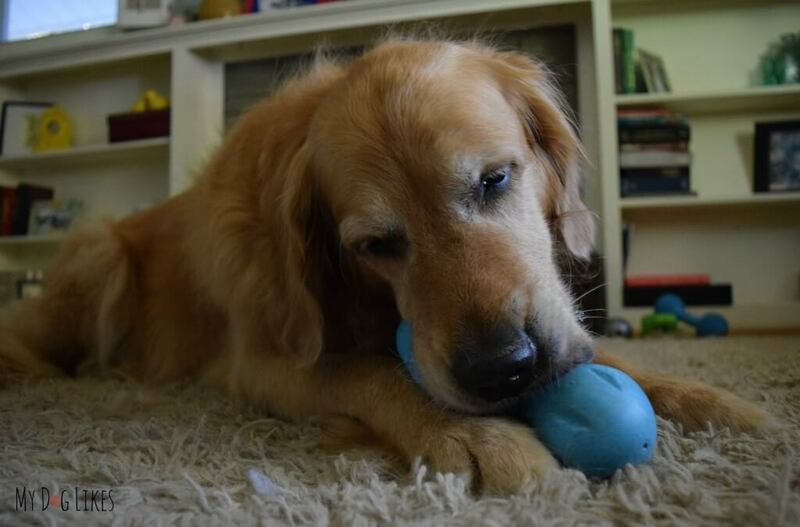 Here at MyDogLikes we are on a constant search for tough and durable dog toys. In fact, our experiences (both good and bad) on this particular quest were one of the main motivations for creating this website. Every dog owner understands the frustrations when a new toy is ripped to shreds in a matter of moments. Not only is this a waste of money, but fragments of these poorly designed toys can become a hazard for your pet! We want to help you find something that is worthy of your hard earned money and SAFE for your pet. That is why we have compiled the list below of the toughest dog toys on the market – all broken down into preferred play style. 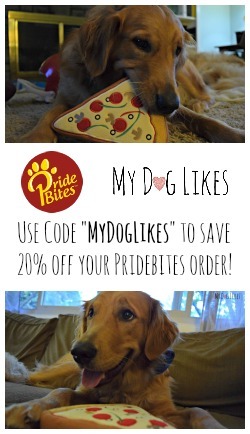 So browse away, and pick out a great new toy for your best friend! Though it should be noted that no toy is indestructable, and supervision is always recommended! All dogs love to chew. It is an innate desire that can lead to destructive behavior if ignored. That is why it is so important to provide your dog with a safe outlet to satisfy this desire! When it comes to chew toys, below you will find the best of the best – all designed to handle some serious abuse. Nylabone chews are made from an extremely durable nylon and serve as a great substitute for real bones. That is because they are tough enough to last for a very long time, but not hard enough to crack or damage a tooth. By design, these bones simply wear down over time. You will also note that small pieces of the plastic become raised during chewing. These actually act as bristles to clean your dogs teeth while they continue to chew. It is important to note however that regular Nylabones are not meant to be ingested – if your dog does manage to break off a piece larger than a grain of rice you should take it away immediately! Nylabones are available in dozens of fun shapes and sizes perfect for any breed or level of chewer. Click here to browse Nylabone on Amazon! 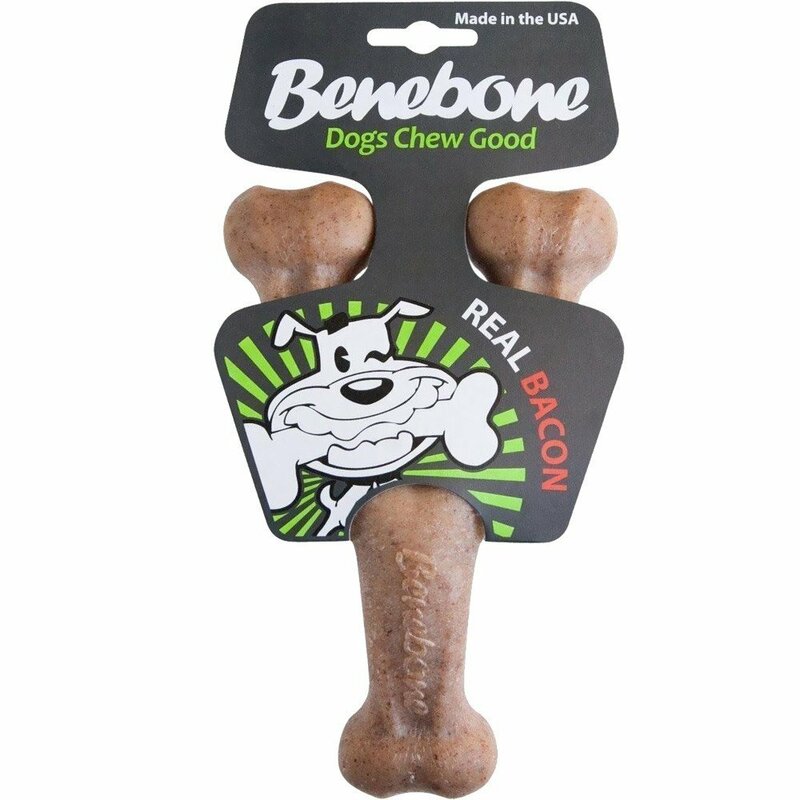 Similar to the Nylabones, Benebones are a dense chew formed from a tough nylon. They come in several different shapes, but we particularly love the Wishbone Chew. This version has been carefully designed with a built-in curve – allowing for one end to pop up into the air for easier access while chewing. Be warned however that this is a large chew, clocking in 6 oz. and measuring 7″ x 5.” Benebones are all made in the USA and come in both peanut butter and bacon flavors. Click here to pick up a Benebone on Amazon! Flavorit bones put a unique spin on the standard nylon dog chew. While they come in several flavors themselves, the real innovation comes from the embedded “flavor cells.” These small indentations are designed to accept your dogs favorite spread to further entice them to chew. Flavorit chews are also made in the USA which is a huge plus in our book. UPDATE: Pet Qwerks now offers BarkBones – a curved version of this chew! 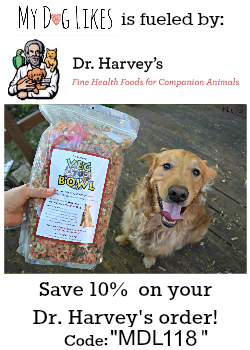 Click here to pick up a Flavorit Bone on Amazon! What could be better than getting a snack while you are enjoying a chew? The toys below can all be stuffed with your dogs favorite treats to entice them to work out some of their excess energy. Figuring out how to access the treats also provides some very important mental stimulation for your dog. No doubt one of the most well known tough dog toys, but for good reason. The original Kong is a fun and interactive toy that has been keeping dogs occupied and stimulated for over 30 years! 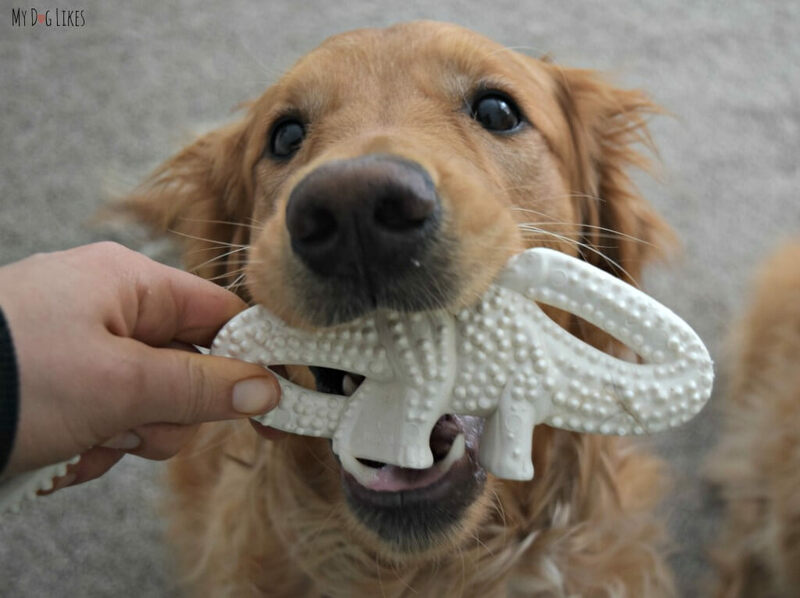 It is made from a thick rubber which provides just the right amount of “squish” dogs love during chewing. At the same time, it can stand up to some seriously heavy abuse. The real innovate aspect of this toy is that it has a hole in the bottom which is designed to be filled with treats. Not only will the smell entice your dog to start chewing, but the sound of treats rattling around inside will get them really amped up! 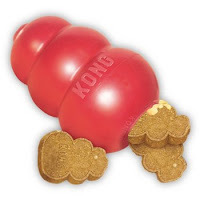 You can fill KONG’s with whatever treats your dog enjoys although KONG does make their own treats that fit perfectly inside, as well as an aerosol can that dispenses a paste right inside! Not tough enough? The KONG also comes in an Extreme version for the strongest of chewers! Click here to pick up a KONG on Amazon! PetSafe’s Busy Buddy line of dog toys come in tons of fun shapes and sizes. They are made from a tough scented rubber that can put up with some heavy duty chewing fun. Each treat dispensing version presents a different challenge for your dog, as they try to figure out just how to get at the goodies inside. As we have mentioned previously, this type of stimulation is extremely important for the health and happiness of your dog. Click here to browse Busy Buddy Toys on Amazon! 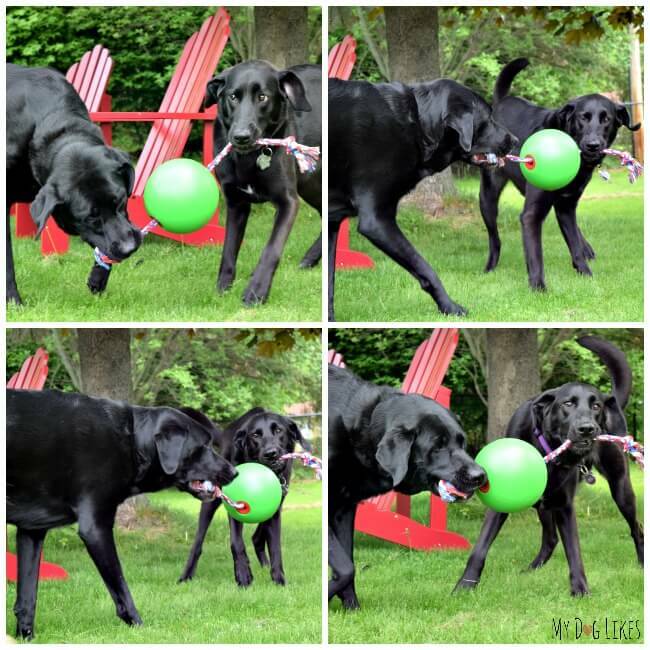 We have had nothing but good experiences with West Paw Design’s Zogoflex dog toys. This proprietary material is durable, flexible, buoyant, non-toxic and even recyclable. They come in tons of fun shapes which are excellent for chewing, fetching, tugging and more. There are even a few different treat dispensing versions! Best of all? 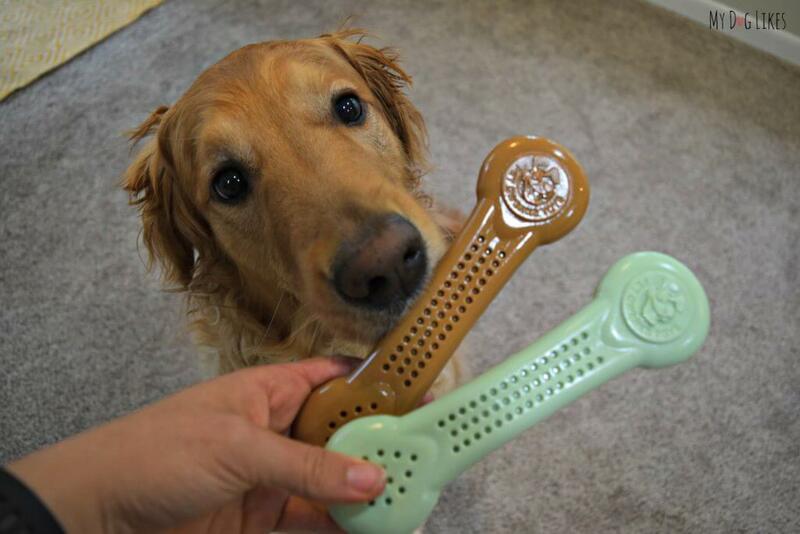 West Paw offers a one time product replacement guarantee should your dog manage to destroy one of their Zogoflex toys! What do you have to lose?! Click here to shop West Paw Designs Toys on Amazon! 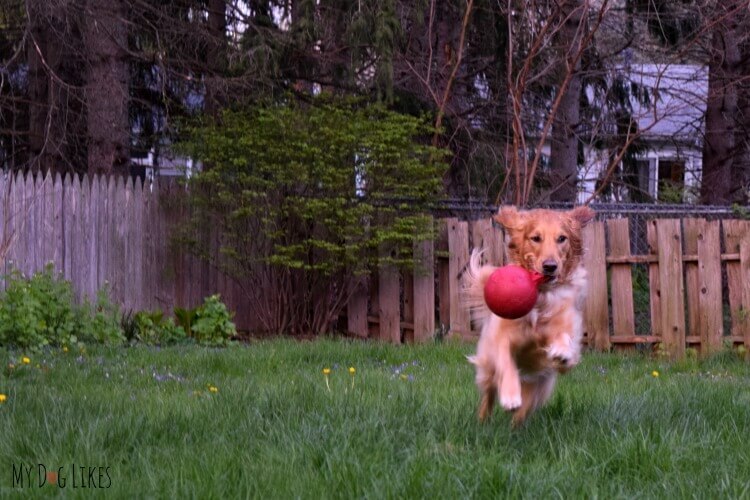 What could be more fun than running and chasing? 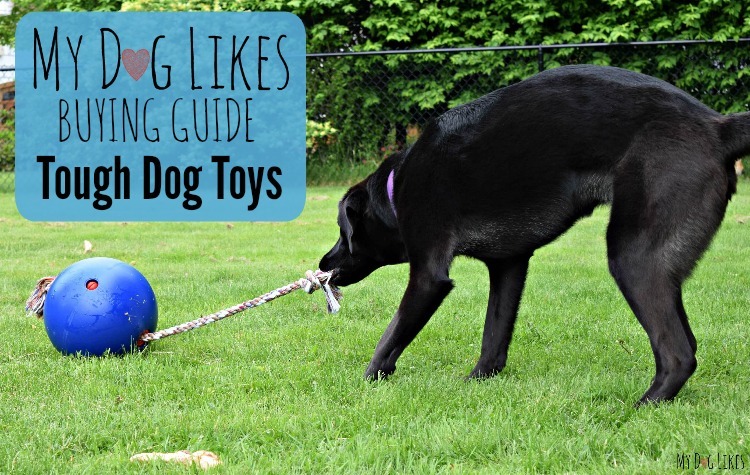 If your dog loves to fetch, we highly recommend the toys below for tons of outdoor fun! 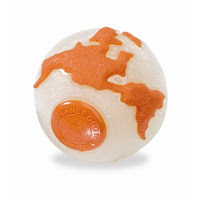 Orbee balls are spherical dog chews manufactured by Planet Dog from a very durable proprietary material. They are bouncy, buoyant, biodegradable and non toxic. They come in several sizes and styles for added fun – including mint flavored, glow in the dark and even treat dispensing. Most importantly for our boys, Orbee balls have just the right amount of “squish” for what seems to be a pleasant chewing experience. Click here to pick up an Orbee Ball on Amazon! The Chuckit! Ultra Ball is one of the most durable balls on the market. The size of this ball makes it super versatile (its the size of a standard tennis ball) which allows the ball to be used in other tennis ball accessories like the Chuckit! Launcher and Fetch It Carrying Case. Unlike the Orbee ball, the Chuckit! Ultra Ball doesn’t have any chew-able pieces that can come off, but it does provide that perfect squish for chewing. This ball is super bouncy and even floats on the water! This has fast become one of our favorite balls! Click here to pick up the Chuckit! Ultra Ball on Amazon! 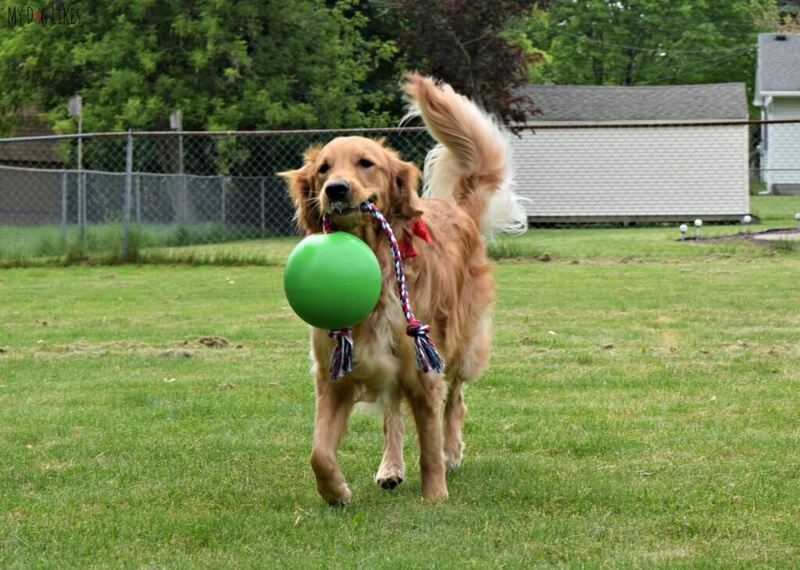 The Jolly Ball is one of our absolute favorite outdoor dog toys, and in our opinion belongs in every dog’s backyard. This large, hollow ball is constructed from a thick rubber and includes an attached handle for easy tossing and carrying. The material is the perfect blend of flexibility and durability. Best of all – since it is not inflated, it cannot be popped. 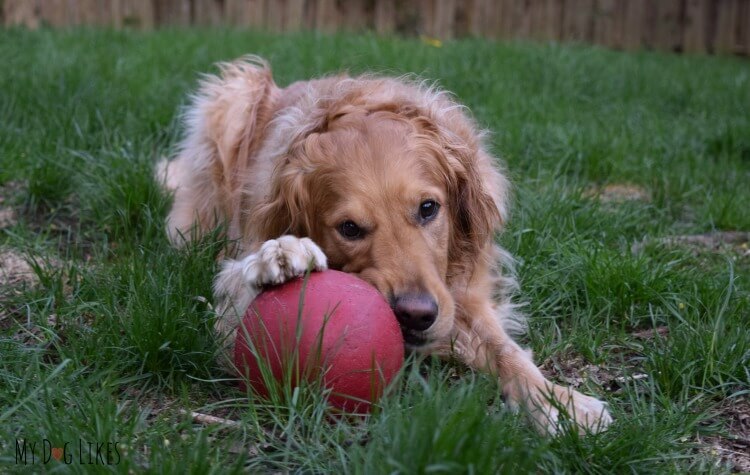 Even if your dog chews into the handle or side of the ball, it maintains it shape – and they will continue to love it. Our Jolly Ball has lost part of its handle, and been sitting outside for YEARS, but it remains a favorite to kick around! Click here to pick up the Jolly Ball on Amazon! For all you frisbee lovers out there – our top recommendation for durability is definitely the NERF flyer. This disc is made from a tough thermoplastic rubber which is flexible but also extremely resistant to sharp dog teeth. As you can see, this disc has a unique cutout pattern which makes it very easy for your dog to pick up and carry. It even floats in case you want to move your game of fetch to the water. 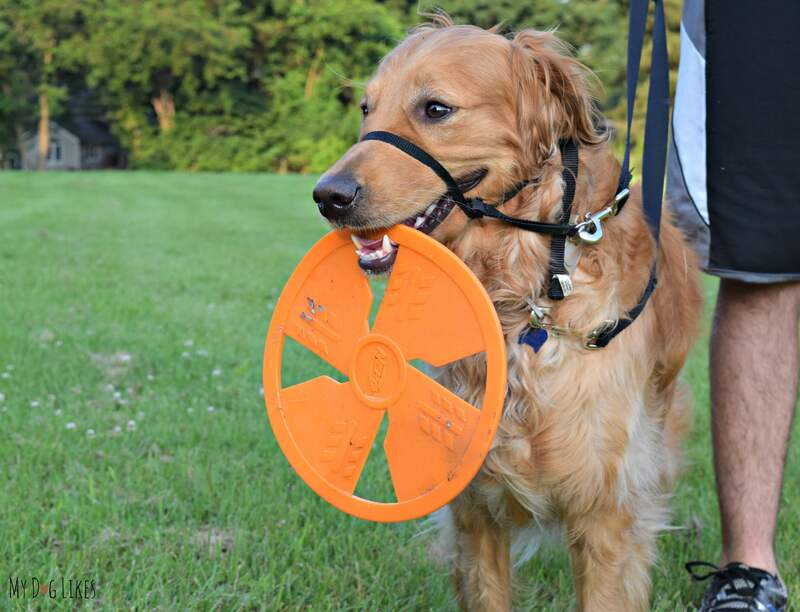 Plus, it flies fast and far – also nabbing the NERF Flyer a spot in our list of the best dog frisbees! 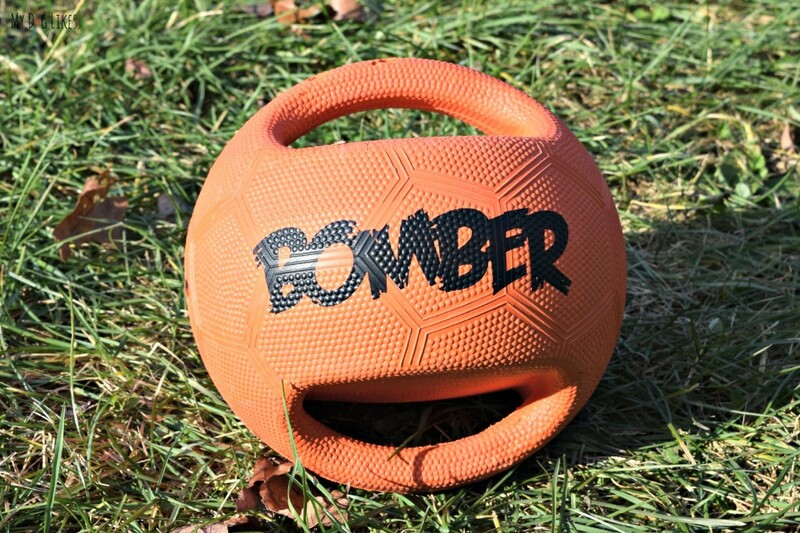 The Zeus Bomber is an interesting toy that looks similar to a basketball – with handles. It is extremely tough (and quite heavy) – so much so that it will actually hurt your foot if you kick it! Stick to throwing this toy and your dog will love chasing after it and carrying it back. This bad boy can put up with some SERIOUS abuse. If your dog likes to tug, you know that they will turn anything into a tug toy. The toys below are designed specifically for the task – and can put up with some serious tugging force! True to its name, the Tuggo dog toy excels in tug. It consists of a large, hollow sphere with a rope running through the center. This rope is free to move back and forth, making it especially fun for multi-dog play. The shell is constructed of an extremely tough plastic that I have a hard time envisioning any dog doing serious damage to. As an added feature, this ball can be filled with water to add weight to an already heavy toy. Not only does the water sloshing around add to the Tuggo’s intrigue, the added resistance makes it challenging for even the largest and strongest of dogs. 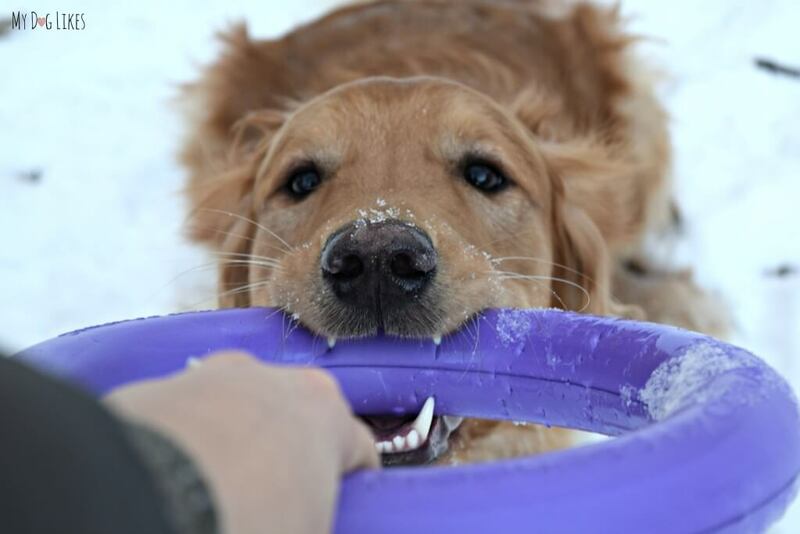 The Puller consists of a pair of large rings and is one of the most versatile dog toys on the market. These rings are made of a durable foam rubber which can withstand a ton of force from pulling or chewing. Though it will develop small teeth marks over time, it remains no worse for the wear. In fact, the ability for your dog to slightly sink its teeth into this toy makes it all the more appealing to them. Aside from tugging, this toy is also great for fetch, exercise drills and even training. By including a second ring in each set, Puller opens itself up to a huge variety of play possibilities. Does your dog have a soft side? These plush toys are tougher than they look and a great option for those dogs who like to cuddle just as much as play. Do not be deceived by appearances. Kong Braidz are shockingly tough, with the ability to withstand significant tugging force. While not intended for straight chewing, this toy is very durable during play and can stretch to twice its length. Kong Braidz are also soft and therefore a great choice for those pups who enjoy a good cuddle. They come in tons of different varieties and even special holiday versions. Click here to shop Kong Braidz on Amazon! Tuffy’s were given their name for good reason. Each of their products is ranked on a toughness scale from 1-10, and designed for durability. They are soft yet rugged, with incredibly strong stitching. As a matter of fact, some versions have 7 or more layers of stitching! Tuffy’s are available in a wide variety of fun shapes and sizes with some measuring as large as 12″ x 18″ x 6″! They are worth picking up just to see your dog adorably drag something that size around! Click here to pick out a Tuffy toy on Amazon! 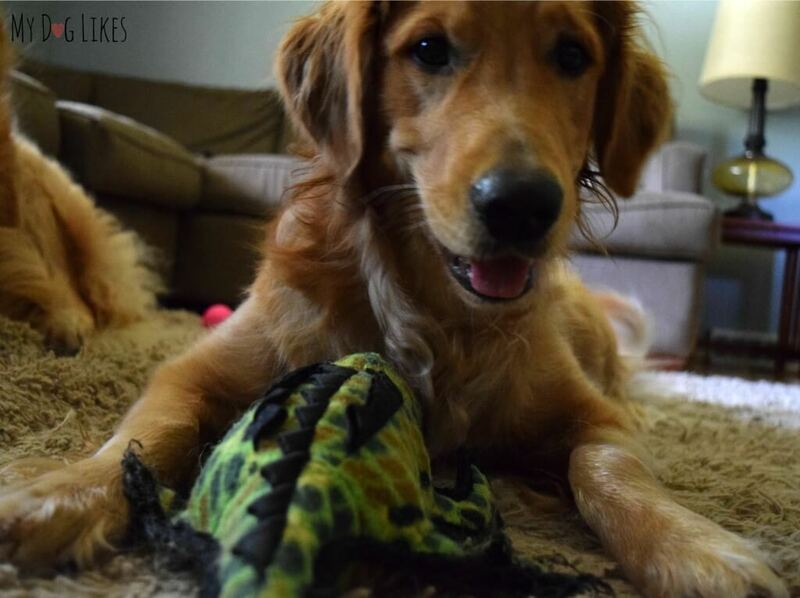 Please share some of your favorite tough dog toys in the comments below! We have two doberman who love to chew their toys to bits, we found these Green Starmark Everlasting Fun Ball Chew Toy and use them to stuff treats into and as tennis balls (They like to break normal tennis balls too). These balls have lasted nearly three years now, we recommend them to all our doberman owning friends! Tuffy’s has definitely been my dogs’ toy of choice. They love plush toys more than the plastic toys but I hate it when they tear all the stuffing out. With Tuffy’s they have a more difficult time. Tuffy’s is a bit more expensive than a regular plush dog toy but they last a heck of a lot longer (for my dogs anyway). Harley feels the same way about plush toys – he will always pick one of them over anything else. Although Tuffy’s can be a bit more pricey, they last a long ime and can withstand heavy chewing and play. We have tried a few Tuffy’s over the years (including the octopus) and have always been pleased. My dog is a chewer and destroyer and we love the West Paw Design, Tuffy & Kong toys. He has yet to destroy those toys, however, we do have some Kong toys that he has made a dent in. 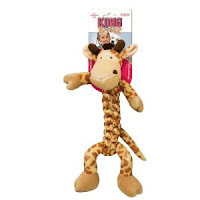 I’m not familiar with Orbee and I stay away from stuffed and unstuffed toys, but will try the Kong Braidz. The West Paw Design bones have by far held up the best. We LOVE Westpaw! Let us know if you have success with the Braidz…they arent quite as tough if they are sitting down for a chew, but they are so tough for tugging, pulling etc. Lots of good tough toys and chew items on the list. Our problem is we need an indestructible bed! Bailie still goes in her phases of bed shredding! Sharing this for those who have destructive dogs! The Zogoflex toys & Benebones are a huge hit around here; and thus far Laika hasn’t managed to make a dent in any of the Zogoflex ones we’ve gotten. Great list, and there’s a few here I haven’t tried yet but I’m adding them to my wish list. One weird toy that makes my list that I wasn’t expecting is the Chuck It Glow Ball. For the first year we’d just play fetch with it (it’s really cool & makes an awesome noise too), and out of curiosity I let Laika have it for awhile to see what would happen. Months later and it’s still in one piece and it’s nice & squishy so she loves chewing on it. We will definitely check out the glow ball! Charlie loves anything that can be fetched so I am sure it will be a hit! What a great selection of tough dog toys! I know that we’ve always had a hard time finding one that doesn’t get ruined the second our dog Stanley begins playing with it! Thanks for the research on this! I got a Tuggo for my dog. He played with it a little, but his play buddy really liked it. My dog doesn’ t really play with toys unless another dog is around. His best play buddy, however, rips everything apart. She’s part Lab. Forget the Tuffys. I was desperate to find a soft toy (his favorite) for my 10 month old rottweiler. The packaging touted it the ‘world’s tuffest soft dog toy’. There was even a photo of a rottweiler on the packaging. Carefully I read the description of 7 rows of stitching, 3 layers of material, protective webbing and a squeaker safety pocket. Five minutes after giving it to him, I went to check on him and see how it was going. He’s laying on the bed in a sea of white fluffy stuffing. Total time for complete destruction was 15 minutes. Don’t waste your money. I would never classify any plush dog toy as indestructible, but the Tuffy’s are the strongest that we have found. We have probably a dozen of these toys that have seen heavy use and are 5+ years old. In our experience, if your dog wants to destroy a soft toy, they will be able to, so we try to encourage certain types of play instead. Stuffed toys can be great for tossing, tugging, and mouthing, but should never really be left for a dog to settle in for a chew. That. Company that will replace the toys my dog chews up is about to go out of business. My dog shreds kongs like ita nothing. His name is Piggie. Hea a big 7 year old chunly baby of a pitbull. Im going to go buy aomething right now because ots the last time I will HAVE to unril they seee what my monster can do. My girls have destroyed even the blue Kong’s. Hurley toys may well be paper airplanes. One girl had slab fractured a tooth on Nylabone. A friend’s dog lost a canine to a jolly ball. The ONLY toy they have not destroyed is the Best ball. Best is the brand. It is super lightweight and smooth. They cannot pick it up. They play soccer with it, pushing it all over the yard. I have Tollers. Our two rescue Labs age 4 and 11 have two Tux and two Jive from West Paw which have lasted three years. They are in great condition. These pups are heavy chewers and have shredded Kongs, Nylabones ,West Paw Hurley and Bumi toys. Every road toy gone in a minute. Chunkit balls have been great! However the Chunkit Duo balls strap was gone after a good tugging they tore the strap in less than five minutes.